Hello, dear neighbors ! Adding cooked beet (yes, please do not fret!) 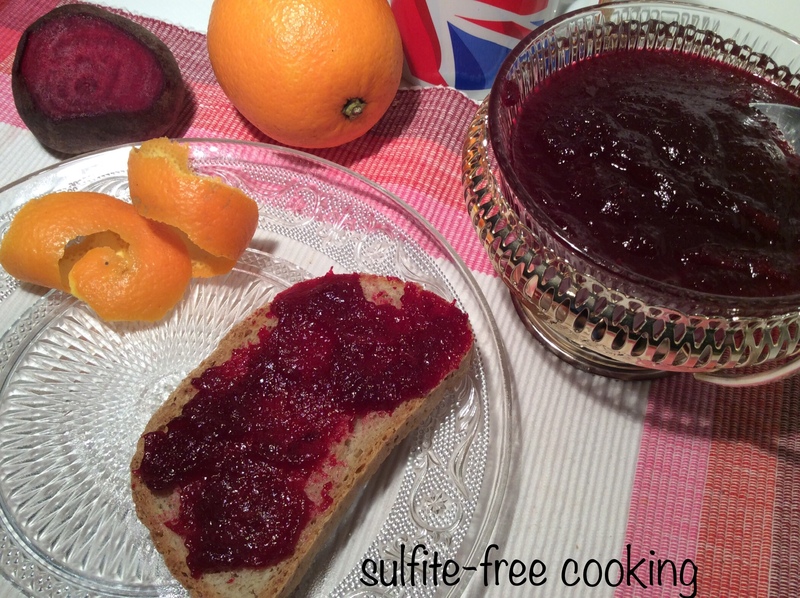 to orange in this jam recipe achieves two purposes : it softens the bitterness of the orange peel in the final product, and also allows you to cut down on the amount of sugar needed to make jam. I came up with this unusual idea a long while back, way before I decided to « double blog » in French and in English. So as I was making the jam a few weeks ago I decided it was time to take new photos and post it here. We were having crêpes and the only jars we had left were blackberry jam, my husband’s favorite, but not mine. I like jam with a little more character, if I may say, for instance pear with small pieces of ginger. As always, a word of wisdom 😇: this jam, not being loaded with tons of sugar, will not keep quite as long as a store-bought version, even refrigerated. So if like me you do not eat jam every day storing it in small jars is a better option. 1. Cut beet in chunks. 2. Pare off a small piece of orange rind and set aside. This piece will be used to make as many thin strips as you wish to put in your jam. I use about 10g of the rind. 3. Pare the oranges over a bowl, making sure no white skin is left. Cut into chunks, removing seeds as you go. 4. Blend beet and orange with an immersion blender. Pour into a saucepan. Add sugar and TBSP lemon juice. 5. Chop up reserved rind into thin strips and add to the saucepan. Set to cook on low after boiling point for about 20 minutes, stirring occasionally. 6. Add agar powder and boil, still on low, for about 2 minutes. 7. Pour into sterilized jars, put covers on tightly and tip over. Keep jars upside down until opening time. We are (finally) coming to the end of winter, dear neighbors, which means now is the time to eat oranges before they lose their flavor ! There are many ways to enjoy them, for instance in a salad as in this recipe, shared by Kathryn who, like many of us, must be longing to spend more time outside tendering her beloved garden ! Such a unique combination, dear Joelle, yet I am sure it works – thank you for a brilliant idea! Thank you 😊! This morning I had it on top of (unsweetened) improvised gluten-free pancakes instead of agave nectar / maple syrup. Very good! Do you guys make jam? What a great idea! Fabulous colour too. I will try this in the summer when the raspberries are ripe. Thanks for sharing. You’re very welcome, Kathryn 😊. Are you thinking of combining raspberries and beet then? Yes, do you think it would work? I like the idea of reducing the sugar content of any jam so I think it might be worth some experimentation. I don’t see why not. The only problem with raspberries (although much less so than blackberries) is the presence of seeds. I always run my blackberries through a vegetable mill before making the jam. I am always looking for new combinations, so I hope you will let us know how your idea comes out, even if the result isn’t up to your expectations! By the way, I attempted to make vegan pancakes this morning, hoping that a chia egg would work… another failure. Either I am no good at vegan cooking (very likely) or eggs are just not negociable in certain recipes!